One argument excusing pit bull attacks is that if a pit bull attacks, there were warning signs that were missed. This blames the victim and/or owner and also presumes that pit bull attacks are always provoked and a last resort communication when other attempts to communicate to the victim that the dog is uncomfortable by growling, body posture, or avoidance have failed. This is indeed usually true for most dogs, but pit bull attacks are very often predatory. Predatory attacks occur when the victim did nothing but exist in proximity to the pit bull; they happen with no provocation, without warning, and manifest in seconds. These attack accounts demonstrate this. This list of attacks does not include attacks without provocation or warning when invading homes to attack or leaping from upper stories to attack to attack. Those attacks are listed separately. 2017 - This story describes a kind of serial attack by a previously friendly dog that only rabid dogs an pit bulls commit. When this friendly and playful family pit bull slipped its collar, the way it wanted to play was to attack any living thing it encountered and so it did attack several people. While rabid dogs aren't playing and are in anguish when they do this, they are the only other kinds of dogs known to commit these serial, unprovoked, unnatural attacks. 2017 KY - A pit bull broke free of its fenced-in yard to attack a girl unprovoked as she was walking to the school bus stop. These incidents with children waiting for the bus are so many that this is a pattern that should also be tracked. 2017 - The video of this completely unprovoked and unnatural kind of attack shows just how perverse pit bulls are. Notice the pit bull isn't agitated in any way and seems to skid to a halt after jogging past two people and realizes it wants to attack one of them. It then makes a u-turn, turns back to attack the woman from the front and launches an uninhibited protracted attack on the woman for no earthly reason. 2017 FL - Video from FB. 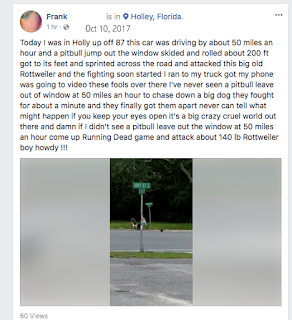 A pit bull jumped out of a car and attacked a rottweiler. 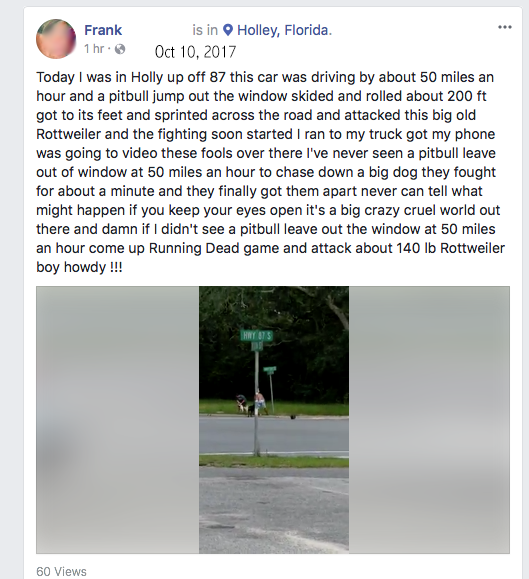 According to the man who took the video, the car was moving at a high rate of speed when the pit bull jumped out o the window and rolled about 200 feet after it hit the pavement before it began attacking the rottweiler. 2017 CA - Pit bulls attacked a 10 year old poodle named Bobo while Bobo was being walked on a leash by his owner. Watch the video of these pit bulls pulling their owner over just to have the pleasure of killing another dog. 2017 NY - A woman's beloved Maltese was killed by a pit bull that jumped out of a car window and attacked him. This does not happenwith other kinds of dogs. From facebook. 2017 TX - Two pit bulls bust out of a window to attack a man who was just walking down the sidewalk. The victim was driven to a medical center and treated for injuries to his leg and foot. This is not acceptable pet behavior. Pit bulls are unacceptable as pets. 2017 FL - Horrific attack when pit bulls bust through the window of their house to attack two women on the street. The news outlet had just done an "investigative report" that showed that pit bulls weren't the most dangerous dog (according to pit bull advocates), so the news anchors were mystified on why they were reporting pit bull attack after pit bull attack (get better experts). 2017 IL - Completely unprovoked predatory attack on a little dog that didn't interact with the pit bull at all caught on video. Watch the nasty pit bull run down the street to attack an innocent little dog. 2017 TX - Unprovoked pit bull attack seen on video taking a 7-year-old down like puma takes down a goat. Is that all our kids are worth to us? Is having pit bulls in our neighborhoods really worth this price? No and no. 2017 NY - Pit bull caught on video launching a devastating attack on a toddler completely unprovoked. Do we value our children this little? 2017 AR - A boy riding his bike is taken down by a pit bull. The boy runs away, but the pit bull keeps coming. 2016 - Gabriella Jones was walking to school when the dog came up from behind her and grabbed the girl's arm in his teeth and bit the girl's face. A neighbor witnessed what had just occurred and immediately tried to intervene to rescue the girl. "I thought that my life was going to end right there," Gabriella said. "It bit me on my leg and then went up to my ear. 2016 ME - A 10 month old Boston terrier puppy was killed while being walked on a leash when two pit bulls escaped their double fencing containment system for the express purpose of killing the little puppy. The owner is devastated. 2016 WI - A mother was pushing her 15-month-old son in his stroller when two pit bulls rushed them and attacked the toddler in the stroller. The baby's mother was attacked when she tried to save her son. The mother and toddler reportedly both sustained serious but not life-threatening injuries. The owner doesn't know how the pit bulls escaped. The victims were simply walking down the street and were completely unaware of the existence of the the pit bulls until they attacked. 2016 FL - A woman and her little dog were attacked by a pit bull that jumped out of its yard for the sole purpose of attacking. 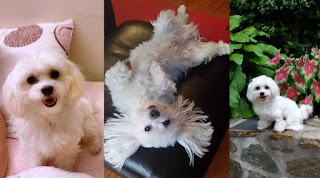 The little dog was killed and the woman is in critical condition 2 days after the attack. Her jugular veins were severed which means her throat was ripped out and the top of her skull was removed. The pit bull jumped back into its yard when first responders came, then jumped back out again to attack at which time it was shot by deputies. 2016 PA - A man and his daughter were walking down the street near a home where pit bulls were kept. One pit bull jumped through a hole in the fence for the sole purpose of attacking the daughter. She sustained injuries to her finger and leg. Her father attempted to stop the attack and was then attacked. At that point, two more pit bulls jumped out o a window of the home and attacked the man. 2016 FL - Three pit bulls happen upon a sleeping homeless man and attack him unprovoked leaving life-threatening injuries. The attack is captured on surveillance video which shows that the attack was 9 minutes long, completely unprovoked, and the man was completely helpless to stop it. 2015 NJ - Witnesses saw a pit bull escape its fenced in yard for the sole purpose of attacking a child. When it got out it made a bee line for a 10-year-old girl who was about to board a school bus. Four people were injured by the pit bull before police arrived, shot and killed the mauling pit bull. 2015 KS - Five year old Korbin Smith was riding his bike on his way to the park with his grandmother when an American bulldog jumped the fence for the express purpose of attacking Korbin. He is going to need reconstructive surgery. 2015 OR - This unprovoked attack caught on video shows how quickly an attack can manifest. The victim dog and owner sustained serious injury within seconds of being aware that the pit bull existed. And, of course, the pit bull could only be stopped with GREAT difficulty. The owner and dog were completely helpless. 2012 Malaysia - Jogger attacked and killed by a bull terrier while jogging. The bull terrier rushed out of its own home to attack the 74-year-old man. 2010 CA - A pit bull jumped out of a moving car Monday afternoon and attacked a smaller dog being walked by its owner, who was also bitten while fending off the animal, Contra Costa Animal Services said. 1988 MI - A man and his sons were walking up their driveway after taking out the garbage when 3 pit bulls attacked the two boys in a ghastly attack. The pits first attacked the 5 year old ripping off half his forehead and damaging his tear duct. They also bit him all over his body. Then one pit turned on the 11 year old boy and ripped off part of his scalp and his ear. Another incident describes such a vicious pit bull it slammed its head repeatedly against a glass door in an attempt to enter and attack.